A few weeks ago I built and posted a small FCP X color correction effect using the Motion template process. While I have no intention of digging deeper into plug-in design, it’s an interesting experiment into understanding how you can use the power of Motion and Final Cut Pro X to develop custom effects, transitions, and generators. In this process, I’ve done a bit of tweaking, created a few more effects, and gotten a better understanding of how it all works. If you download the updated effects, there are a total of three filters (Motion templates) – a color corrector, a levels filter and a DVE. In going through this exercise, a few things have been brought to my attention. First of all, filters are not totally transparent. If you apply my color correction filter, you’ll see slight changes in the videoscopes even when each tab is at its default. This doesn’t really matter since you are applying a correction anyway; but if it annoys you, then simply uncheck the item you aren’t using, like brightness or contrast. Secondly, the exact same filter in FCP X may or may not use the same color science as the Motion version, even though they are called the same thing. Specifically this is the case with the Hue/Saturation filter. My template uses the one from Motion, of course. 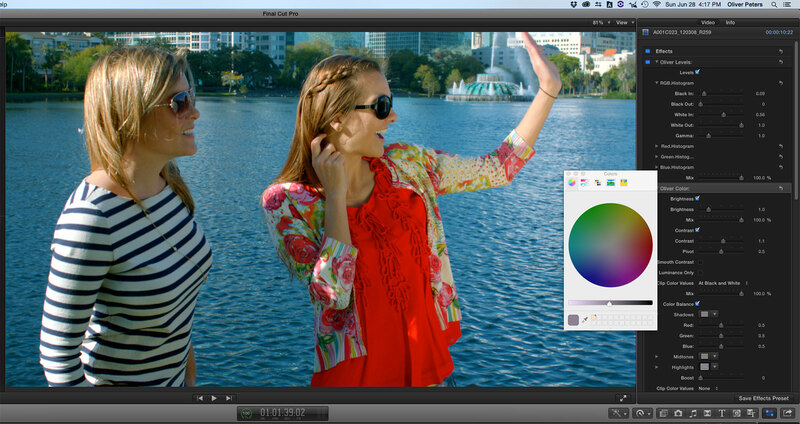 The FCP X Hue/Sat filter uses a color model in which saturation is held constant and luma (a composite of RGB) varies. The Motion version holds luma constant and allows saturation to vary. The quickest way to test this is with a solid red generator. Apply the FCP X Hue/Sat filter and rotate the hue control. Set the scopes to display an RGB parade, vectorscope, and the waveform set to luma. As you rotate the hue around the dial, you’ll notice that the color dot stays neatly in the boxes of the vectorscope and moves in a straight, diagonal line from vector to vector. The RGB parade will show a perfect combination of red, blue, and green values to achieve the correct RMBCGY coordinates. However, the waveform luma levels will move up and down with large changes. Now compare this to the hue control in the Hue/Sat filter included in my template. This is from Motion. As you rotate the hue control around the dial, the saturation value moves in what seems to be an erratic fashion around the vectorscope; but, the luma display changes very little. If you apply this same test to real footage, instead of a generated background color, you’ll get perceptually better results with Motion’s Hue/Sat filter than with the FCP X version. In most cases, either approach is acceptable, since for the purposes of color correction, you will likely only move the dial a few degrees left or right from the default of zero. Hue changes in color grading should be very subtle. After I built this first Motion template, I decided to poke around some more inside Motion to see if it offered other filters that had value for color correction. And as a matter of fact, it does. Motion includes a very nice Levels filter. It includes sliders for RGB as a group, as well as individual settings for red, green, and blue. Each group is broken down into sliders for black in/out, white in/out, and gamma. Then there’s an overall mix value. That a total of 21 sliders, not counting opacity, which I didn’t publish in my template. Therefore, you have fairly large control over grading using only the Levels filter. I thought about building it into the earlier Oliver Color filter I had created, but ran into some obvious design issues. When you build these effects, it’s important to think through the order of clicking publish on the parameters that you want to appear inside of FCP X. This sequence will determine where these values appear in the stack of controls in the FCP X inspector. In other words, even though I placed this Levels filter ahead of Color Balance within Motion, the fact that I clicked publish after these other values had already been published, meant that these new controls would be placed to the bottom of my stack once this was displayed in FCP X. The way to correct this is to first unpublish everything and then select publish for each parameter in the order that you want it to appear. A huge interface design concern is just how cluttered you do or don’t want your effect controls to be inside of FCP X. This was a key design issue when FCP X was created. 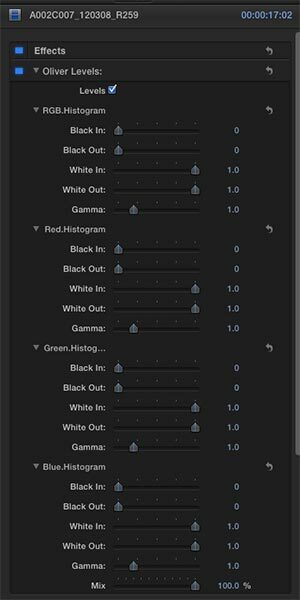 You’ll notice that Apple’s built-in FCP X effects have a minimalist approach to the number of sliders available for each filter. Adding Levels into my Color filter template meant adding 21 more sliders to an interface that already combined a number of parameters for each of the other components. Going through this exercise makes it clear why Apple took the design approach they did and why other developers have resorted to various workarounds, such as floating controls, HUDs, and other solutions. The decision for me was simply to create a separate Oliver Levels filter that could be used separately, as needed. An interesting discovery I made was how Color Board presets can be used in FCP X 10.2. When you choose a preset from the Color Board’s pulldown menu, you can access these settings as you always have. The downside is that you can’t preview a setting like you can other effects in the effects palette. You have to apply a preset from the Color Board to see what it will look like with your image. 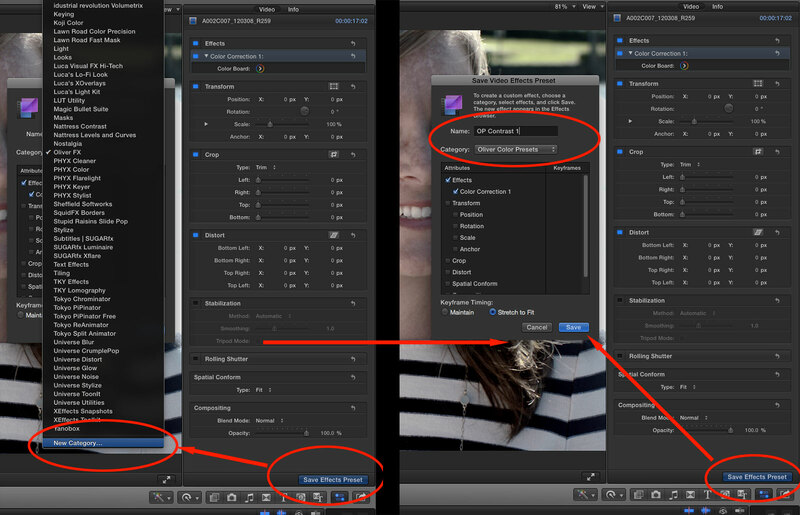 FCP X 10.2 adds the ability to save filter presets. Since color correction using the Color Board has now been turned into a standard filter, you can save color presets as an effects preset. This means that if you have a number of Color Board presets (the built-in FCP X settings, mine, or any custom ones you’ve created) simply apply the color preset and then save that color correction filter setting as a new effects preset. When you do this you get a choice of what category to save it into. You can create your own, such as My Color Presets. Now these presets will show up in that category inside the effects palette. 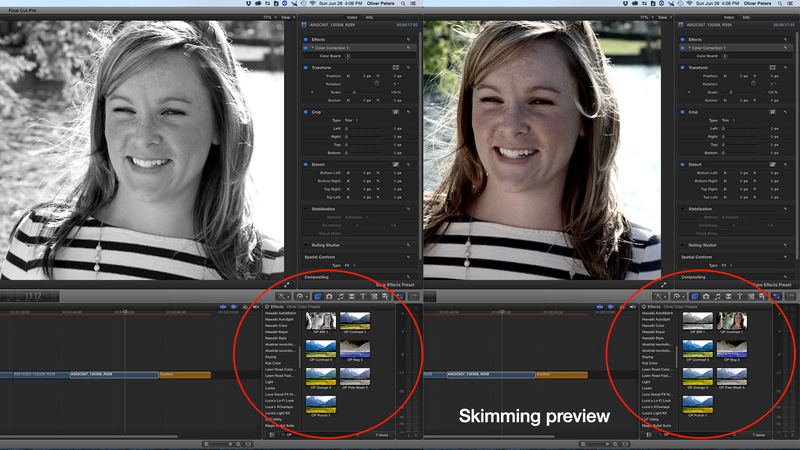 When you skim over the preset icon, your image will be previewed with that color correction value applied. Although these presets appear in the same palette as other Motion templates, the effects presets themselves are stored in a different place. They are located in the OS X user library under Application Support/ProApps/Effects Presets. For example, I created 40 Color Board presets that can all be turned into Effects Presets visible within the Effects palette. I’m not going to post them that way, but if you feel ambitious, I would invite you to download the Color Board presets and make your own effects presets out of them. All of this is a great way to experiment and see how you can use the resources Apple has provided to personalize a system tailored to your own post needs. Click here to download the Motion template effects. Click here to download updated and additional Motion template effects (FCP X 10.2.1 or later). Click here to download the Color Board presets. For some additional resources for free plug-ins, check out Ripple Training, Alex4D and FxFactory. This entry was posted in apps-gear-filters, color grading, Final Cut Pro X, My Projects, tips and tricks and tagged color grading, FCP-X, plug-ins, workflows.